There are two versions of this quiz included. 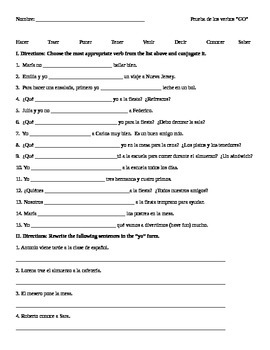 One is more advanced and requires the students to choose from a list of verbs to determine which one would best fit into each sentence (There are 15). 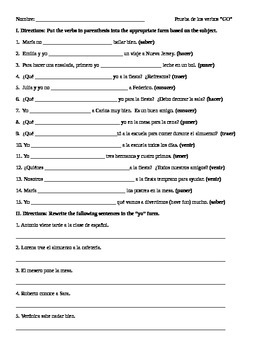 The second part of the quiz (5 questions) requires students to rewrite a sentence from the 3rd person singular into the 1st person singular. The second version is similar with the exception that they are given the verb to conjugate. 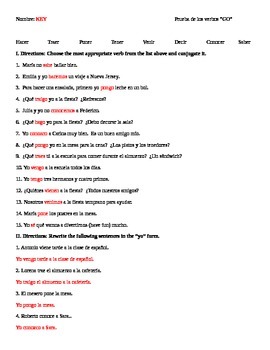 The verbs included are: Decir, Tener, Venir, Traer, Hacer, Salir, Poner, Saber, and Conocer. Can be used as a quiz or a worksheet.